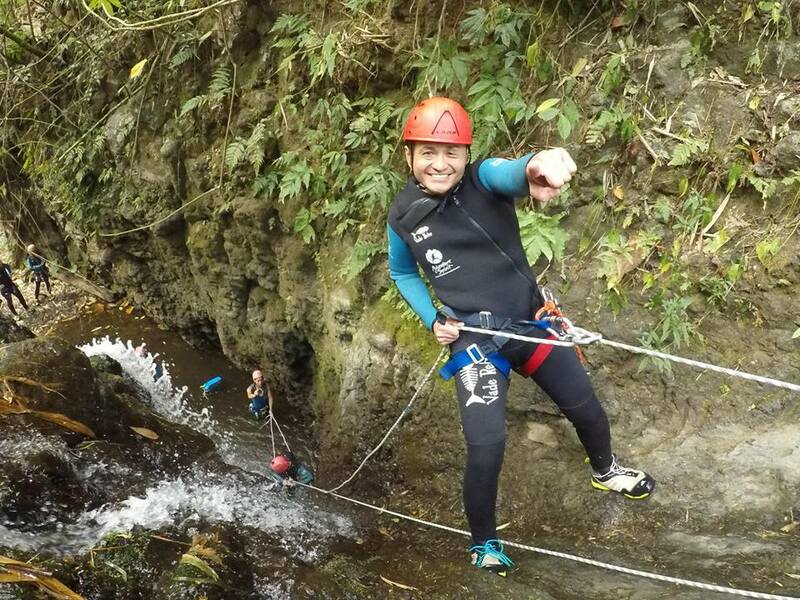 This canyon is perfect for initiation but also a sporty descent with lots of fun! A canyon for everyone, including children from 8 years of age and above. You will certainly enjoy this descent and enjoy a snack while we marvel at the last waterfall. Kalimudah provides an unforgettable day in the middle of the wild Balinese nature! 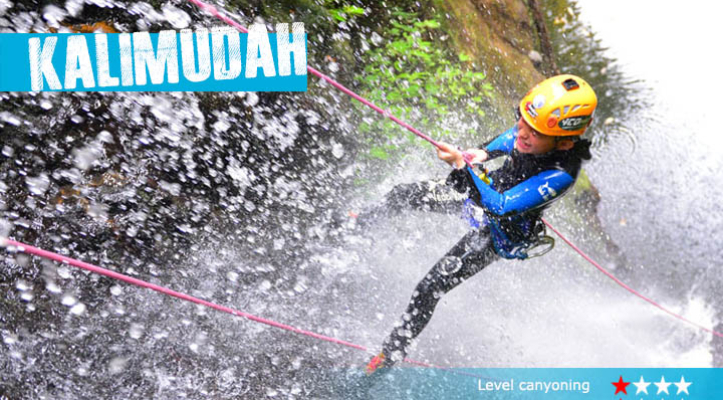 If you have never practiced canyoning before, you will surely become addicted to the sport. 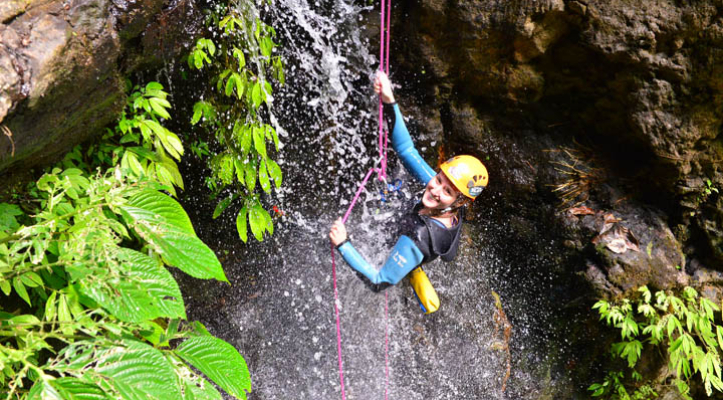 If you are already experienced, Kalimudah will be a great way to discover a Balinese canyon and increase your confidence and knowledge about canyoning! Super expérience remplie d’emotions. Un très bon encadrement pour notre première en canyonning. Wonderful expérience site a lot of emotions. We feel sage withnthe guides for our first time ni canyonning. The fun and energetic guides (who were brothers and cousins) was what really topped off the experience. You can tell they are very enthusiastic about their job, but yet still every skillful and experienced which made it feel safe. It was my first time and they taught and demonstrated the techniques thoroughly. This was a whole new experience for me and I will definitely want to try another canyon with Adventure and Spirit the next time I return to Bali. I initially signed up for just the Kalimudah part, but we had to option to continue finishing the entire Kerenkali Canyon, which everyone did since we were all having a such a good time. The trip included transportation, breakfast, snacks, lunch, water, and photos! Transportation was at least 2.5 hours each way. 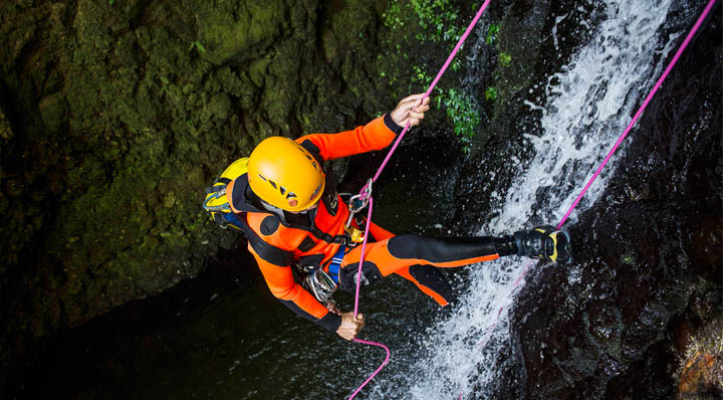 Nous n'avions jamais fait de canyoning. Les deux personnes qui nous ont accompagnés étaient super professionnelles. Nous avons fait le parcours complet. Le parcours est visuellement magnifique et super dynamique. On enchaîne les sauts, les toboggans et les rappels. 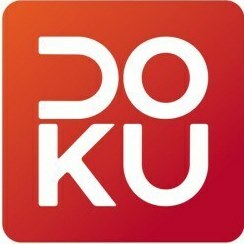 Nous étions 4 dans un groupe de 8 personnes + les 2 guides. Just brilliant! The highlight of our trip! Thanks to the lovely team for being so nice and professional! Special thanks to Anga who was so encouraging and helpful, I have a fear of heights and he just encouraged me at my own pace and I got to try everything at the end which was awesome. Thank you so much! Great experience and even greater instructors. Face your fears and grow. We had a super fun time and the tour was everything we wished for! Thank you, guys!! The best activity I had in Bali. Very nice guides. Safe and fun. Nature was great! The Double K trip was amazing! A must do! Our instructors were great!! Thanks to Adrien, Amin and Rama! would like to give 6 stars!!! amazing tour! great guide! this is real BALI! exciting and adventuring ... if you are scared about height or other things, you should not do this tour. but it's so much fun - even for people that are not that sporty (like me). perfect equipment and trustful guide. would do it again every time!!!! Excellent morning trip for ages 12-55! Everything was nice, it was excited than I expected and the instructors were very nice. 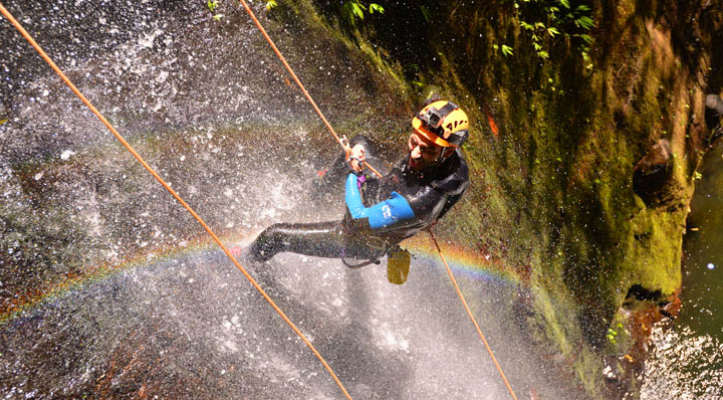 I will definitely to do canyoning again in later. Super fun canyon! Our 9 and 10 years old boys loved it as well. Great instructors with Adrien and Imin, always ensuring the safety of the participants. High quality equipment. So much fun! Rama, Jess, and Ermin were great! Very very good adventure !! Heaps of fun especially the jumping part! Très belle expérience!!! J'ai offert ce cadeau surprise à mon compagnon et il était vraiment ravi ! Le personnel est très sympathique, il met en confiance et explique bien les gestes à réaliser. Il vous accompagne bien tout du long et est à l'écoute. Tout est bien organisé, du pick-up à l'hôtel jusqu'au moment où ils nous ramènent. Nous avons eu un petit déjeuner, un goûter dans la forêt puis un repas une fois rentrés au centre. Nous étions dans un groupe de 10 personnes, nous venions tous d'endroits différents mais l'ambiance était vraiment conviviale et sympathique. Le staff prend plein de photos et vidéos donc si vous n'avez pas de Gopro personnelle, ce n'est pas grave. L'endroit est vraiment beau et naturel surtout ! Nous gardons de bons souvenirs et n'hésiterions vraiment pas à recommencer avec Adventure & Spirit, ça vaut vraiment le coup! Encore merci à eux !! It was a fabulous experience with great guides. Thank you so much, Rama and Win. We had a great time, and can't wait to do this again! It was a great experience and our tour guides made it so much fun. This is a definite must do. Best time of my life! 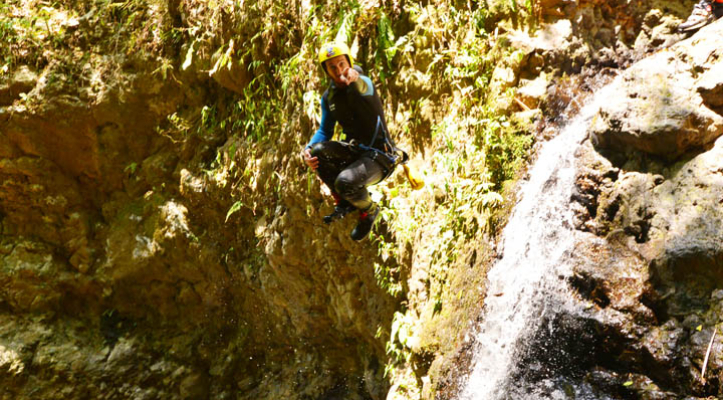 I had an AMAZING day canyoning with Ruma and Win. They were fantastic guides, very encouraging and enthusiastic about what they do. I will definitely recommend A&S to anyone who likes an adventure and I look forward to seeing you guys again! 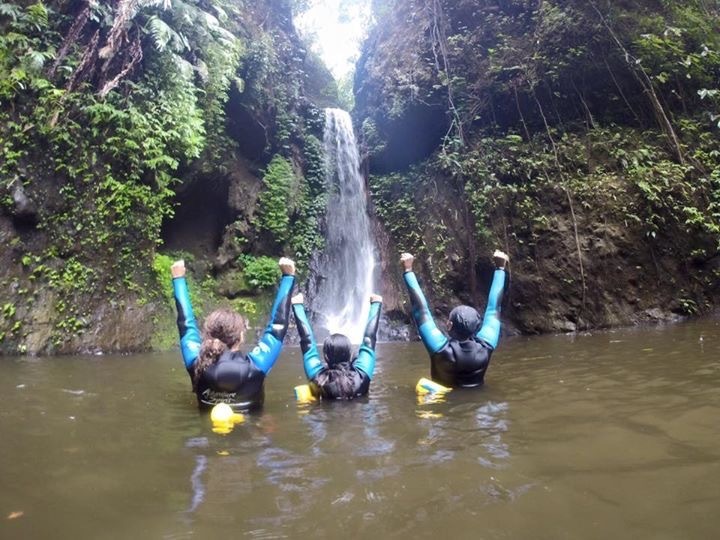 Rama, Angga and Enez were our awesome guides through the canyoning experience. It was by far the best run experience that we undertook in Bali. One of the best experiences we had in Bali! The instructors were fun and friendly. The location is absolutely stunning. 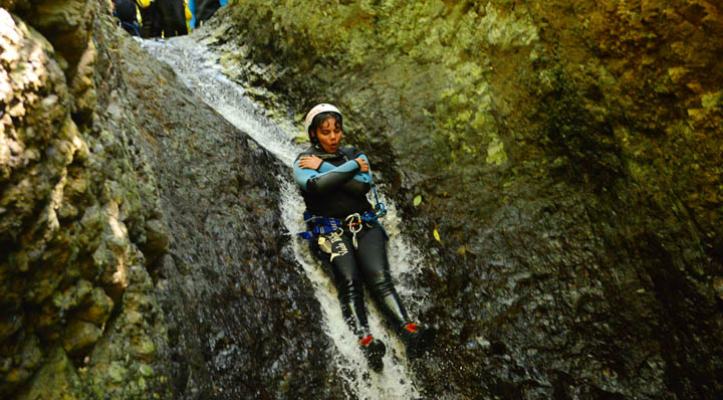 All the different things we got to try (sliding, jumping, zip-lining, rappelling) definitely made the trip worth the cost. Would highly recommend! Absolutely amazing experience!!! Our guides were patient and made us feel like we were safe every single jump!!! Thank you for this exhilarating experience. One comment we had is our driver that picked us up in Ubud was a crazy driver and everyone in the car felt scared to death as he weaved and honked constantly the entire 2 hour drive. Also, he stopped off at a Luwak coffee location which none of us were expecting and some felt forced to make a purchase. Other than that, even though it was raining and had thunder, we had a great time!! !